The names of Alton Sterling, Philando Castile and so many others were no doubt on his mind. And how little time would pass before the world was stunned yet again by the images of police murder. On September 16, Terence Crutcher was killed in Tulsa, Oklahoma. Four days later came the wrenching images of the disabled Keith Lamont Scott being gunned down in Charlotte, North Carolina. It never stops. As protesters chant “say their names,” the list is unending of those killed for the “crime” of being black in the racist U.S.A. No wonder what the media call the “Kaepernick effect” keeps spreading. Colin Kaepernick, who is biracial, took a stand knowing there would be repercussions against him. He did so “because I’m seeing things happen to people that don’t have a voice, people that don’t have a platform to ... have their voices heard.” Predictably, soon after he began his protest, videos of jerseys with his number being burned while the national anthem played went viral, gaining massive media attention. Whipped-up flag-waving outrage followed fast and furious. Racists booed Kaepernick, the head of the San Francisco Police Officers Association railed against him. So did many capitalist politicians and media mouthpieces, as well as some fellow sports figures. The Santa Clara police that patrol the 49ers’ home stadium threatened to withdraw their “protection” – their way of menacing violence against Kaepernick and all who might back his protest. However, the threats backfired as other sports figures and anti-racist youth around the country took up his cause. 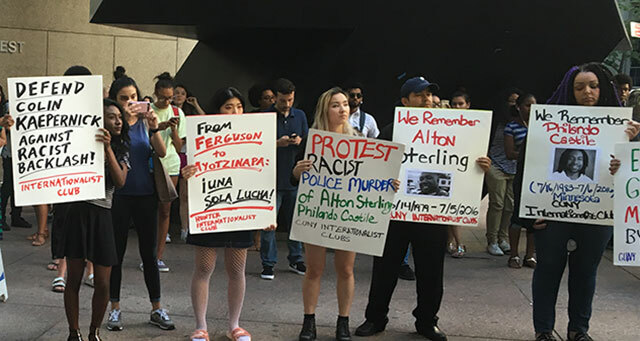 “Defend Colin Kaepernick Against Racist Backlash!” read Internationalist Club signs at the Hunter College Speak-Out Against Racist Repression we organized on August 30. NFL executives were quoted saying they “truly hate” the “traitor” Kaepernick. Like a master giving orders to a slave, sports “analyst” Trent Dilfer said the quarterback should “be quiet and sit in the shadows.” But instead of being cowed into silence, more and more fans and players showed solidarity with Kaepernick to give voice to the outrage of millions. He had told the truth. Black and brown people are oppressed in America. There are “bodies in the street,” and over and over again, police who do these murders are rewarded by the state. 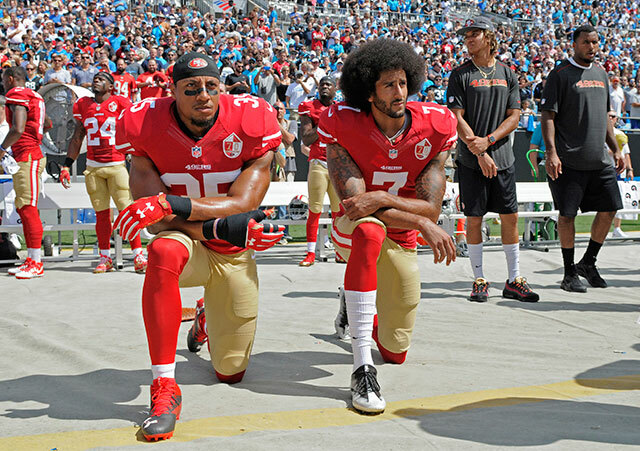 Among the sports stars emulating Kaepernick’s action were his teammate Eric Reid, the Seahawks’ Jeremy Lane, and many players for the Miami Dolphins. Megan Rapinoe, a professional soccer player for the Seattle Reign, joined the protest too. Rapinoe, who came out as a lesbian in 2012 and is known for her work with the Gay, Lesbian & Straight Education Network, accurately denounced the backlash against Kaepernick as “overtly racist.” Soon enough, she too was targeted for denunciations. Then the protest started taking off among college teams, harking back to last year’s Mizzou (University of Missouri) football team’s strike against racism. (See “Mizzou Football Team Takes a Stand With Mass Protests Against Racism,” Revolution No. 12, March 2016). Most recently, Howard University cheerleaders joined the protest. Now it has spread to high-school teams across the country: “Students Are Pulling a Kaepernick All Over America – and Being Threatened for It,” reports The Intercept (23 September). The whole football team, players and coaching staff of Seattle’s Garfield High School showed solidarity with Kaepernick’s protest. This is the same high school that fought against standardized testing back in 2013. In Worcester, Massachusetts, a courageous high-school football player named Mike Opping resisted blowback from the administration, telling the press: “I’m standing up for the injustice that happens to black people every day, not just cops killing black people. We are disrespected and mistreated everywhere we go on a daily basis because of our skin color and I’m sick of it.” In Beaumont, Texas, an 11-year-old player was threatened with death for leading a Kaepernick-inspired protest. After all, even the capitalists’ own U.S. Supreme Court declared in 1943 that it’s unconstitutional for public schools to force students to salute the flag. For that matter, fielding a question on Kaepernick during a press conference, president Barack Obama replied that the 49ers player was exercising his constitutional rights to express his views on “real, legitimate issues that have to be talked about.” Of course, the Commander in Chief of U.S. imperialism then went on about “the flag and the national anthem and the meaning that it holds for our men and women in uniform who fight Washington’s dirty wars. Yet many of those duped into putting on the military uniform have seen and experienced things that made them get wise to the “patriot game.” In fact, there is a whole group called #VeteransForKaepernick. What’s striking is that jingoistic appeals to patriotism have not intimidated young students into “staying quiet,” and more and more decide to “pull a Kaepernick.” A recent example is that of the Castlemont High football team in Oakland, California. On September 23, the players lay on their backs with their hands up during the national anthem; Colin Kaepernick came out in person to support them. 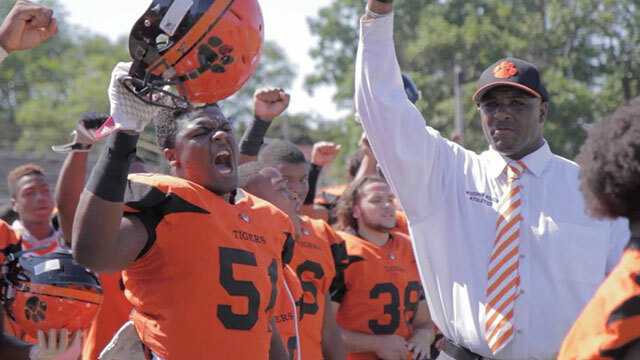 One of the most inspiring examples is that of the Woodrow Wilson High School Tigers in the desperately poor city of Camden, New Jersey, which was extensively covered by BBC’s on-line news magazine (22 September). Together with their coach Preston Brown, the entirely black and Latino football team has braved an onslaught of on-line abuse, derision, demands that they “get out of this country,” as well as death threats. While racist flag-wavers show “so much hate towards us,” in the words of offensive lineman Daniel Medina, the team has continued its protests and has taken to standing with fists in the air. The Olympic action was partly inspired by Muhammad Ali’s famous protests against racism, and the boxing great’s denunciation of U.S. imperialism’s war against Vietnam: “I ain’t got no quarrel with the Viet Cong.... No Viet Cong ever called me n----r.” It helped set a pattern of protest followed by some – even amidst the big-business world of professional sports. In 2012, LeBron James and the Miami Heat set an example for a new generation of athletes by wearing hoodies in tribute to Trayvon Martin after his assassination by a racist vigilante. Two years later, at a game with the Knicks in Brooklyn LeBron wore a t-shirt with the words “I can’t breathe” to protest the NYPD chokehold murder of Eric Garner. Kaepernick’s act of sitting out the national anthem was replaced early on by “taking a knee,” which he explained as a way to “show more respect” for armed forces personnel. Showing “support for the troops” is a standard way that the powers that be try to “mainstream” protests and channel them into expressing loyalty to the imperialist rulers who lure youth from the working class and oppressed communities into their armed forces to kill and die for their profits. Fists in the air in the style of Carlos and Smith is a gesture of defiance and refusal to be intimidated – a strong message that players from the Los Angeles Rams, Kansas City Chiefs, Tennessee Titans and other teams are putting forward now as part of the protests Kaepernick touched off. The Pentagon-paid “measures of public recognition” included “sponsored military displays.” While some of the payola was reportedly returned, it’s just the tip of the iceberg in the sports industry in which racism and support for imperialism have always been deemed big boosts for the profit margin. In reality, one of the key purposes of sports spectacles has been to whip up patriotism, in order to divert the working class. We just saw that again with the Olympics, when people chant “U.S.A., U.S.A.,” athletes like Simone Biles drape themselves in the American flag, and the media count how many medals “our country” has won. Then there are the endless brawls by fans of the British, French, German and other soccer teams, with “soccer hooligans” providing recruiting grounds for rightist goon squads. The stone racist Wilson purged African Americans from federal jobs, praised the 1915 KKK propaganda film Birth of a Nation (originally called The Clansman) and showed it in the White House, while ordering Marines to occupy Haiti, the Dominican Republic, Panama and Nicaragua and intervene against the Mexican Revolution. Discussion on this verse has led some to dig out their American history books to brush up on how the “Star-Spangled Banner” got written in the first place. To make a long story short: like most of what gave rise to this country, it’s about slavery. It was written by the slave owner and pro-slavery politician Frances Scott Key. Key was also the mentor and brother-in-law of Roger Taney, who became Chief Justice of the Supreme Court and handed down the Dred Scott decision in 1857. That decision infamously stated that blacks had no rights that whites were bound to respect. It criminalized aid to escaping slaves. The verse cursing slaves and hirelings (workers) for daring to disobey their masters has rightly drawn the attention of lots of young people. The more we dig into the matter, the more we see that racial oppression is in the DNA of the “red, white and blue” and the bourgeois republic for which it stands, under the almighty dollar, with oppression and injustice for all – except the tiny minority who live from the labor of others. So we need to go farther than a critique of the particular words to this anthem and dig into what the whole patriotism business is about. We’ve all heard liberals say that police terror is the result of a few “bad apples,” rushing to say they don’t oppose the police forces per se. In a similar way right now, quite a few anthem protesters hurry to declare that they are just as patriotic as the next person. In contrast, Marxists stand against capitalism’s patriotic flag-waving, period. As revolutionaries, it’s our job to expose the falsehood that workers and the oppressed share common interests with the exploiting class that runs and owns what they want us to call “our country.” As Karl Marx and Friedrich Engels wrote in the Communist Manifesto, the workers “have no country” – we are an international class. Against bourgeois patriotism and nationalism, we stand for proletarian internationalism. Our anthem is “The Internationale,” the world-wide song of workers revolution that was written for the Paris Commune of 1871.